It seems like the media has helped make the words polar vortex another popular weather phrase that everyone is using now to describe really cold weather events. 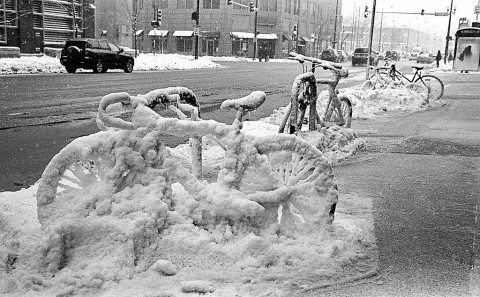 Don’t forget, there was also snowicane, snowpocalypse and snowmageddon… It may just be me, but there’s much more fuss about cold weather these days than there used to be. The Weather Channel didn’t help when they started naming winter weather systems during the 2012/13 winter season. It’s a phenomenon that signals a return to colder weather across North America… Or, as it used to be called, November. Anyway, what is a polar vortex (or arctic vortex) and why does it happen? Is there really any difference between these vortex events and “plain old” really cold weather? A polar vortex is a large mass of the coldest air that sits over the arctic region of North America. While the polar vortex may seem like a new phenomenon to a lot of people, it’s something that meteorologists have been studying for many decades. Every now and then, this mass of cold air gets displaced by areas of high pressure over the Pacific, pushing the colder air south over Canada and into the upper regions of the United States. When the polar vortex weakens, deep pockets of cold air can plunge southward along the jet stream and cause temperatures into sub-zero readings across the Plains states. During these events, temperatures can dip as far down as the single digits in parts of the south and can even cause readings into the teens and 20s — and yes, even snow — as far south as Florida. OK, so a polar vortex is not just any mass of cold air. But what are blizzards and nor’easters about? Are they related to the polar vortex? A nor’easter is a type of counter-clockwise cyclonic storm that causes winds to come in from the northeast — hence the name nor’easter. Nor’easters most often occur in the late fall, winter, and into the spring. Nor’easters are formed by areas of low pressure (which can also form into hurricanes over tropical waters), and they are associated with cold fronts and dropping temperatures in the upper levels of the troposphere. Many types of winter weather — such as snow, ice, and sleet — typically occur in advance of or just behind cold fronts. This would be caused by precipitation falling through cold levels of the atmosphere. If temperatures at the ground level are cold enough (32 degrees or colder), snow and ice will accumulate. Wintry mix events occur when snow and rain fall together. Sleet, in North America, refers to ice pellets. In many nations, sleet means a mixture of rain and snow. Wintry mix often falls in the transition zone between rain and snow and may occur when ground temperatures are slightly warmer than 32 degrees. Doesn’t A Polar Vortex Event Disprove Climate Change Or Global Warming? Some people may think that extreme cold weather events means climate change isn’t happening. In fact, extremely cold winter events may actually be a terrific indicator that the climate is changing. Climate change, which is often associated with temperatures getting warmer over the course of time, doesn’t mean we’re going to be basking in tropical heat all year long. Climate change, in relation to temperature, means a region will either warm up or cool down over the course of time. Again, climate change refers to long-term patterns. Extreme cold weather that lasts only a few days are short-term weather events. What’s important in tracking overall climate change in regards to temperature is not so much how cold it gets over one or two days or how high the mercury rises during a heat wave, but where the long-term temperature trends are going. What many scientists theorize is that climate change will create more extreme weather events, which means we could see more serious arctic weather events, as well as an increase of extreme heat waves, longer periods of drought, and so on. So, in short, a few really cold days in the winter doesn’t negate climate change. A heat wave isn’t, in itself, global warming. (We’ve always had heat waves, too — and really bad ones, like the heat wave of 1936.) But the frequency of these events may be indicators of more serious, long-term changes that are happening to our climate.